The crisis of 1943, at least, is obvious to anyone even vaguely aware of World History. This was the year that the Allies became confident that the Axis forces would be defeated. The tenor of the war effort changed, from a hope of survival at great cost, to the expectation of the enemies’ unconditional surrender. It was a time when people began to think beyond the war to what life after the war would look like. Jacobs focuses on one particular school of thought, which he calls “Christian humanism.” The definition of this movement is complex, but can be summed up as effort to use literature to morally form people into good citizens. This approach to moral formation is built on Christian sentiments, in particular, since Christian humanists saw the Christian faith as the only foundation suitable for a just society. The Year of Our Lord 1943 is an ambitious work. It surveys a wide range of sources, but mainly deals with the work of Jacques Maritain, T. S. Eliot, C. S. Lewis, Simone Weil, and W. H. Auden. Dorothy L. Sayers, Hannah Arendt, Jacques Ellul, and others make appearances, but the first five are the main cast. Not only is this an impressive lineup of writers whose work Jacobs digests and presents, but at many points their vision of the good society is different. They had a common core of ideas, to be sure, but their ideas for what good should look like and how it should be obtained were variegated. The work is also impressive because Jacobs weaves the various streams together rather than using a purely chronological or topical approach. This book is important because it recounts the debate of that day and documents the thinking of the side whose ideas were generally not implemented. Thus, this book helps tie together what are now prophetic themes about how society could have been better ordered. In 1941, the great choice would have been whether or not to do what it took to survive. Nearly any means is deemed acceptable when a nation is staring down destruction or enslavement. However, as the tide of World War II was turning, the question of whether the technocratic policies and processes that were used to help organize the war effort would become permanent fixtures of society was a more pertinent one. The question the thinkers discussed in this book were wrestling is still a pivotal one today: What does it look like to be human in a modern world? This is what many of Jacobs’ projects have been about, especially in recent years. It also marks a perennial question that humanity has traditionally debated, but has lately seemed to get buried beneath a wave of social media, constant entertainment, and unthinking busyness. If nothing else, this book is a call for people to wake up and begin to question whether they are asking the right questions. The Year of Our Lord 1943 is an excellent book. 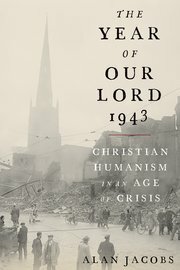 For those that are intrigued by the ferment of thought that comes from Christians exploring the good society in the early- to mid-twentieth century, this book will prove to be a helpful reference. It combines history, literary analysis, and thoughtful critique in a readable text that both enlightens and invites further study. For those who are simply interested in a well-told intellectual history, this volume will provide an enjoyable experience. Those who are trying to figure out how to relate their Christianity to the idea of a good society will find this book useful, as well, as Jacobs helps expose readers to old books by writing a new book about the authors of some of the most important, but often unconsidered, texts of the modern age. People expect evil to come with horns, pitchforks, and an obvious bent toward cruelty. That is, when we meet someone who has done or approved of great evil, we expect them to be obviously angry, psychotic, and express delight in their vileness. Real evil in our real world is seldom like that. Our villains seldom arrive dressed like Cruella Deville or Sauron. But we still expect those that participate in something really bad to be obviously evil. Wicked people who do wicked things rarely have the flair we expect, which should teach us something about the nature of evil. Hannah Arendt’s book, Eichmann in Jerusalem: A Report on the Banality of Evil, helps undermine the expectation of an entertaining bad guy. She does this by presenting a portrait of perhaps the most boring and petty man in the twentieth century who orchestrated some of the most unquestionable evil in the history of humanity. Others are much better equipped to give a more detailed history of the life and work of Hannah Arendt. This BBC interview of a scholar who has studied Arendt offers a decent overview. Arendt was herself born in Germany and was a Jew. She left Germany in 1933 ostensibly to study, but eventually emigrated to the United States, where she remained a citizen until her death in 1975. It is for good reason, then, that Arendt felt a keen interest in the Holocaust. She is best known as a political theorist, though her work is more broadly philosophical than most political discourse of our day. She was also a journalist for the New Yorker, who happened to fund her trip to Jerusalem to see the trial of Nazi war criminal Adolf Eichmann. The book that resulted from her trip to watch the trial, Eichmann in Jerusalem, caused a significant controversy in that day, with apparently coordinated efforts to undermine its spread. The main thrust of the controversy was Arendt’s indelicate handling of the apparent Jewish cooperation with the Holocaust. That claim, even in this post, is somewhat remarkable and needs some nuancing, but it plays into the general idea of the banality of evil. Arendt argued that the Jewish community participated in their own extermination because they largely cooperated with the beginning stages of the Holocaust. This sounds like victim blaming—and perhaps it is to a certain degree—but reading the book, that does not seem to be her intention. What is true is that the Jews in Germany and the other occupied nations rarely resisted the ever-increasing encroachments on their liberty and deprivations of their rights. The community, by virtue of being administratively linked through and led by the synagogue, had recognized structure that often worked with the Germans, always hoping that cooperation at each stage would end the problem. In some sense the Jews did cooperate in their own demise, though it is not clear whether overt resistance would have been successful. Arendt’s intention does not appear to criticize the Jewish community for their cooperation, but to explain why the mild-mannered Adolf Eichmann was able to help murder millions with little or no violent effort. I leave final resolution of that controversy to others, but believe Arendt to be helpful on some points even if she is outrageously mistaken on that one. Adolf Eichmann is the stereotype for the mid-level bureaucrat who is exceedingly efficient at making things move without understanding what exactly what was happening or why it could possibly be bad. While the world—Arendt included—expected a slavering war criminal spewing anti-Semitic epithets from the witness stand, what they saw was someone who did not believe himself to be a war criminal because he was simply doing his job. Arendt reveals Eichmann to be a splendid manager but a terrible human. The unthinking reader might succeed in passing over the horror that Arendt depicts, but the observant ones will recognize that Eichmann is frightening because he is so ordinary. Why does ordinariness frighten? In this case because he managed to participate in such unthinkable evil with such a clear conscience. It is clear from Arendt’s description—which is corroborated by other historical sources—that Eichmann did not consider himself guilty of anything in particular. In other words, Eichmann’s banality is frightening because we are so susceptible to it. Eichmann shows us what it is like to participate in systemic injustice with a clear conscience. I recommend Arendt’s book to readers—particularly contemporary evangelical readers—because it shows without question the power of an unjust system, the difficulty in extricating oneself from it, and the importance of resisting such systems. Though Eichmann was aware of the Final Solution, which he knew included killing the Jews, he had absolutely no sympathy. “The longer one listened to him, the more obvious it became that his inability to speak was closely connected with an inability to think, namely, to think from the standpoint of somebody else.” (49) He was fundamentally a man that saw serving the system as the highest end, regardless of the cost. The inability to speak Arendt refers to is that Eichmann was unoriginal in his thought patterns. He knew talking points and catch-phrases but was blissfully unaware of the conflicts internally between them and did not understand the enormity indicated by his language. This was facilitated by the Nazi efforts to sanitize language and speak of things bureaucratically—using boring systemic language to mark overt evil. One might consider examples in U.S. history such as the idea of “Indian removal,” “separate but equal,” and “reproductive rights” to see how terrible evil can be masked by euphemism. This system can roll right over conscience by convincing the actors they are simply scheduling train cars and not facilitating the deaths of millions of innocent people. Arendt’s account of Eichmann is sobering in our world filled with systems and euphemisms. While some of the pleas about systemic injustice are little more than complaints that life was not unfair in favor of a particular group, conservative Christians have for too long ignored the reality of systemic injustice and our own participation in it. In many cases, we unknowingly participate in such systems and in others we lack the requisite compassion to see the impact of our participation. Eichmann in Jerusalem should cause readers to ask what ideals they are pursuing to the detriment of others and recognize that if that ideal cannot be achieved without the injustice it is not a worthy ideal. The ends simply do not justify the means and they never can.